Responding to commentary regarding the outcome of proposed freshwater standards released by the Ministry for the Environment on February 23, Environment Minister Dr Nick Smith says claims suggesting the proposed standards will result in poorer water quality are “incorrect”. “The 2003 Ministry of Health guideline of not swimming when the level exceeds 540 E. coli/100ml remains. The 2014 NPS included in bold the statement that this is the ‘minimum acceptable state’ for swimming and it remains so”, he said in a statement on Friday. According to Dr Smith, the new attribute state table applies only to swimmability and focuses on the proportion of time a water body exceeds the 540 E. coli/100ml standard, with A (blue) exceeding this less than 5 per cent of the time, B (green) between 5 and 10 percent of the time and C (yellow) 10 to 20 per cent of the time. The Ministry for the Environment (MfE) website further clarifies that to meet the A, B and C attribute states, the annual median needs to be less than 130 E. coli/100ml. This means the infection rate for more than half of the time would be less than one in 1000. “A good example to illustrate the better approach of the new table is the Hutt River below Silverstream, for which we have E. coli data for the past decade. It has an annual median E. coli of 100/100ml yet it exceeded the 540 E. coli/100ml 15 per cent of the time. The 2014 NPS that focussed on wadeability would have assigned it an A attribute state but gave no information on its swimmabilty. The 2017 NPS that is focussed on swimmability gives it a C attribute state. The new approach is consistent with the Land, Air, Water Aotearoa (LAWA) website that today and for more than the last month has described this spot as swimmable,” he explained. “There are three good reasons for the new and more sophisticated NPS table being proposed on Human Health for Recreation. The first is that the focus is on swimmability rather than wadeability. The second is that it connects with the real-time information available on the LAWA website on where people can swim. The third advantage is that it is consistent with the international risk levels for swimming accepted by the World Health Organisation, the European Union and the United States”, he added. The detail of the NPS and Stock Exclusion Regulations are open for consultation. Submissions close 5.00pm Friday 28 April 2017. To find out more about the Clean Water Package 2017 click here. 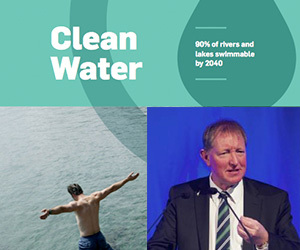 To make a submission on the clean water package 2017, click here.